In my quest to search for delicious cendol througout the country, I was brought to this shop in Malacca. 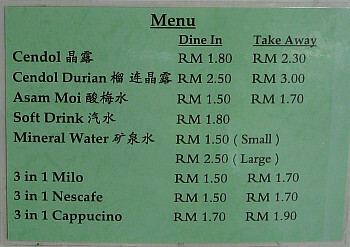 It is located close to Mahkota Parade in Malacca town. However, as it is located along a row of shop houses behind the main road, this place is not that easy to find. 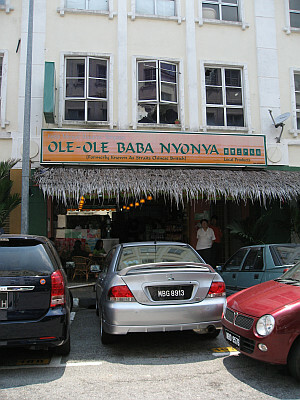 Ole Ole Baba Nyonya is located along Jalan Plaza Mahkota 3, a row of shop houses beside the new Newton Food Court, a stone's throw away from Mahkota Parade and the newer Pahlawan shopping centre. It is located adjacent to Restoran Nyonya Suan and seems to be owned by the same owner. 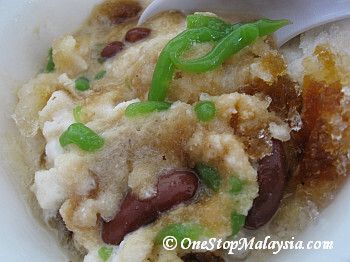 Cendol seem to be the popular dish here. At first look, it seems pretty normal. 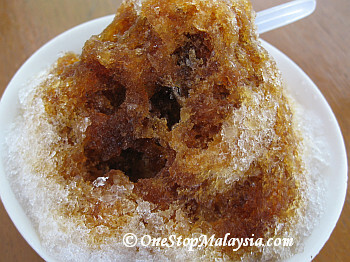 Crushed ice with gula melaka on the top. However, after mixing it up, mmmmm, it tastes really delicious. The santan (coconut milk) is thick and fresh, and the gula melaka seem to go well with it. Hard to pin point exactly what makes this dish so nice, but the excellent blend of everything makes this dessert extremely enjoyable to eat. If I were to compare this cendol with the one at Museum Cafe (Jonker Dessert 88), other than consistency which I can't say as I've only eaten this one once, I would say that the one at Ole Ole Baba Nyonya is slightly (only slightly) better than the one at Museum Cafe. Inside the shop, they also sell dry food, snacks and sweets. The Restoran Nyonya Suan beside it serves Peranakan food. Feel free to add any comment of yours below.